Singer and Songwriter Avril Ramona Lavigne is a Canadian native born on September 27, 1984. Avril is the second of three children born to John Lavigne, a technician for Bell Canada and Judy Lavigne, a stay at home mother. At the age of five, Avril moved from her birthplace in Belleville, Ontario Canada to Napanee, a farming town with a population of approximately 5000 people. Growing up, Avril idolised her older brother Matt Lavigne. Matt who was heavily involved in sports, thus inspired Avril to play hockey and baseball. As Avril grew older she gained a reputation of being an athletic child who preferred taking part in activities like sports, skateboarding–a passion of hers–and camping, rather than more ‘girlie’ activities. 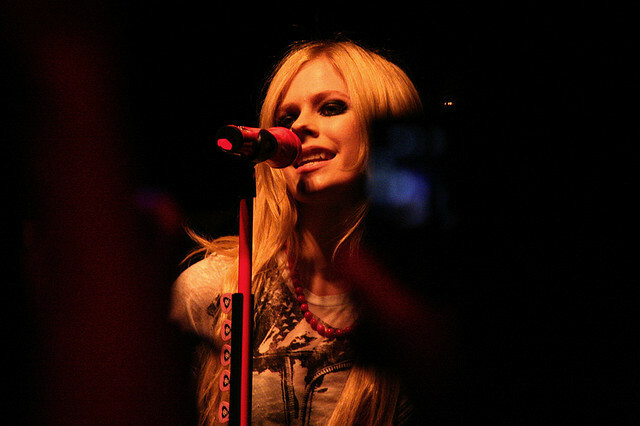 When Avril wasn’t busy playing sport however, she did enjoy singing, and pursued that as a hobby as well. Avril sang in her church choir at the age of ten and sang covers of popular songs at a variety of venues in her community. In 1998 at age fourteen, Avril was discovered by her first manager Cliff Fabri, while singing at a small performance in a local bookstore. Fabri liked Avril’s voice and was impressed by her confidence. In the same year, Avril won a contest to sing a duet with fellow Canadian Shania Twain at the Corel Centre in Ottawa. It was Avril’s first time performing in front of an audience of twenty-thousand people, but she was fearless. Lavigne’s debut album, titled “Let Go,” was released on June 4, 2002, and went platinum in six weeks. The singles “Complicated,” “Sk8er Boi,” and “I’m With You” dominated the charts, and by the end of 2002, Avril’s debut sold 4.9 million copies and was the second best-seller of the year. Avril’s fame escalated with more album sales and several awards. In May 2004, her second studio album was released, titled, “Under My Skin.” In 2006 Avril wrote and performed the song “Keep Holding On,” for the fantasy film, Eragon, then went on to produce and release her third album, “The Best Damn Thing,” in April, 2007. Avril is currently working on her fourth album in studios, due to release in early 2010. Lavigne enjoys listening to bands like: Outkast, Third Eye Blind, Oasis and Marilyn Manson. Lavigne married Deryck Whilbey on July 15, 2006, at a private estate in Montecito, California. Their split was announced on September 17, 2009, and divorce papers are said to be imminent.